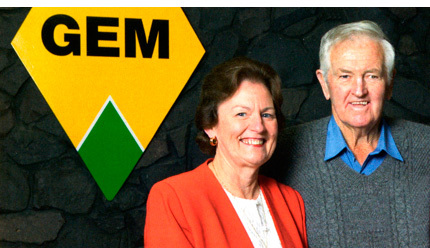 Founded by Ian Sutherland in 1959, GEM provides quarrying, earthmoving, plant hire, landscape supplies, quarrying and retail of limestone ashlars, road construction, pavement surfacing and associated services to the government and private sectors. With operations extending throughout south eastern South Australia and the western districts of Victoria, GEM continues to redefine construction excellence and customer service. Today, we are committed to ensuring a world's best workplace environment and enjoy the collective expertise of well over 100 dedicated staff. Lake Bonney Wind Farms access road construction, flared entrance construction, bulk excavation and hard stand areas, cable trenching and temporary creek crossings. Southcorp Wines earthworks and pavement construction for wine barrel storage and tank farm. Kimberly Clark-Australia Pty Ltd civil construction and road works. Calula Estate Industrial Subdivision earthworks, site levelling road formation and waste effluent systems. Bunnings Warehouse bulk earthworks, sewer construction, water, stormwater and carpark construction. We can provide full service for minor or major projects with the right blend of project management, ongoing innovation and value for money. From driveways to highways, subdivisions to wind farms, quarrying and general earthmoving to limestone for commercial and domestic construction, turn to GEM. Just a few of our recent projects.